I’m thrilled to announce that my seller of this unique listing has officially closed on the sale of this property. It’s not every day you come across 2.4 acres of land for sale on Blue Ridge Road in Raleigh! 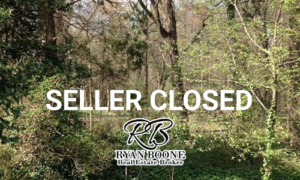 I am pleased to share that our sellers have successfully closed on their offering of 2+ acres of land on Blue Ridge Road in Raleigh. The existing home was originally built in 1957, but this fantastic location lends itself to lots of opportunity well beyond a single family home site. If your’re considering selling property, or would like to buy, in this popular Northwest Raleigh area, please reach out to me to see what’s available on the market today and what real market values look like. I’m available via email at Ryan@HudsonResidential.com, by phone at 919-438-0548, or use my online form here to send a message.